We want to introduce you to a company today which is making a quality play – rather than a bulk one. Its zinc mine in Mexico has some of the highest grades out there in zinc exploration, and has undoubtedly become the envy of several larger players on the scene. The company is on the cusp of production, and proving up zinc grades so high that conventional ore grade testing can’t actually measure them . However, with a market cap of approximately $8 million (at the time of writing), it simply can’t afford to open up a huge zinc mine – yet. Instead, it’s focusing on quality first. By doing so, it’s hoping to feed a plant with throughput of just 200 tonnes per day, which sounds like a lot but is actually rather...petite. However, the cash flow generated from this high grade start up mine will fund its bigger dreams on the horizon. It’s aiming to be a perpetual zinc machine . It takes a canny operator to break the laws of thermodynamics, but this player is aiming to do just that. At the same time, this is a relatively small company and a speculative stock – investors should seek professional advice before making an investment. Instead of rattling the tin every few months, this company is aiming to fund itself through actually making money – just the kind of business plan we can get used to. 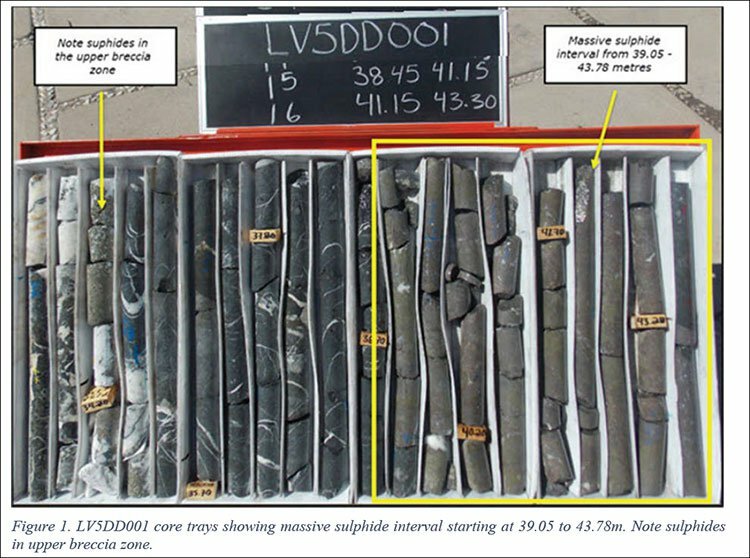 Consolidated Zinc (ASX:CZL)’s Mexican project is the Plomosas Zinc Project, which has already been mined in the past – 2 million tonnes of ore with a zinc + lead grade averaging 22% as well as 2oz/tonne of silver have already been extracted. All it needs is $1M in cash plus a bit of TLC to get the plant up and running again – and cash flow entering CZL’s coffers. There is likely a lot more zinc to be taken from this mine, if the current round of exploration drilling is anything to go by. CZL is anticipating a JORC compliant resource this quarter, with a Scoping Study early next year – in the meantime, plenty of additional resource drilling is expected to keep investors on their toes. And just last week, it secured a Loan Facility which will allow this drilling to be fast tracked... so the next couple of months are looking to be very interesting for CZL. Let’s find out a bit more about CZL’s activities. In a previous life as New Era Resources, the company had its fingers in a lot of pies for an ASX-listed junior. It was chasing a few projects in WA, Sweden, and Mongolia. 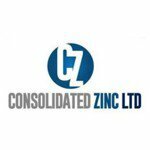 However, with the transition to CZL, the company has narrowed its focus to the Plomosas zinc project in Mexico. CZL currently has a 51% stake in the project, but it is likely to increase this to 80% before production starts. The Plomosas project covers 11 exploration concessions covering over 3000 hectares in the northern Mexican state of Chihuahua, about two hours flight from Dallas to the north east. The project has been mined in the past in several stages down to 270m below surface, with historical zinc extraction reaching over 2 million tonnes of ore with a zinc + lead grade averaging 22% as well as 2oz/tonne of silver. Well known mining consultants SRK Global’s Denver office were drafted in at the early stages of the project to provide a technical due diligence document, with the consultancy confirming remarkably high grades of zinc and lead of about 15% to 20%, with silver of about 60-80 grams per tonne. 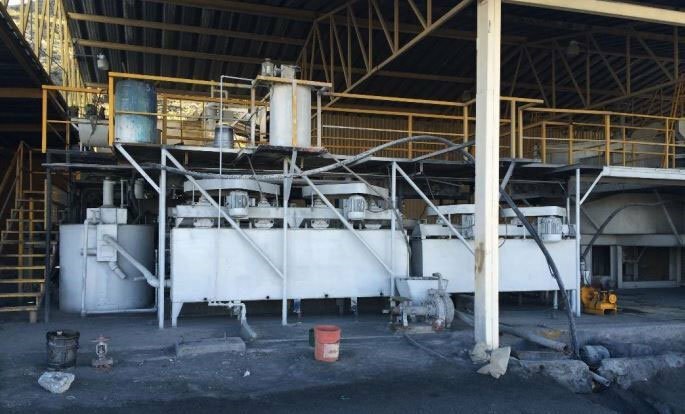 While the silver isn’t the focus of the project, it can be processed with the zinc and lead to provide a credit against the cost of production. It’s still very early stage stuff, but the early drilling has backed up the high-grade nature of the project. The early stage target is for about 2.9 million tonnes to 3.2Mt at grades of 15% to 20% zinc-lead below the current mine. However, this target is conceptual in nature and CZL will need to test its potential resource with the drillbit before coming up with a JORC resource. Being an existing mine, it already has a processing facility on site, which just needs a little bit of TLC to get up and running. The current processing facility has nameplate production of 200 tonnes per day, well below what will ultimately be needed if the drillbit is any guide. CZL estimates that it will cost about USD$1 million to get the plant up and running, and it should provide enough cash generation to fund further drilling. The game plan here is a canny one for a company of CZL’s size. Get some early drilling happening, get a small amount of early-stage production happening, and then use the funds generated from early-stage sales to fund more drilling to prove up an even bigger resource. A lot of companies go after the ‘big Kahuna’ straight off the bat, looking for massive amounts of volume before getting to a point where is can generate cash. However, the high-grade nature of the rocks at Plomosas allow CZL to switch up the game plan. The report goes into a lot of detail about CZL’s plans, but at the same time this is not a guarantee of success. By commercialising at an earlier stage, it will be able to fund further drilling which will in turn hopefully prove up the aforementioned big Kahuna. The key difference being that it won’t have to treat its shareholders as a piggy bank as the costs of the big Kahuna project blow out over time. 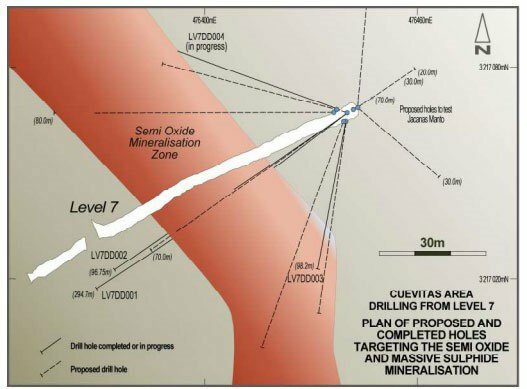 Originally, the plan was to mine below “Level 7” of the existing mine, targeting a section of the Plomosas mineralisation which had not yet been tapped from historic mining. Its early channel sampling efforts brought up promising assays including some which could not be tested by conventional assay methods as they simply contained zinc grades which were too high . In September, the company drilled three holes in the area , with two showing massive amounts of thick sulphide and the third showing patchy zones of sulphide. The great thing about Tres Amigos is that not only was it showing signs of extremely high grades, but previous development at level 5 had cleared a path to the area for a drill. Better yet, the drilling found mineralisation was open from all drill points, meaning that there was more to come. Meanwhile, it was laying the foundations for drilling down in level 7, its original target. But already Tres Amigos was shaping up as the star of the CZL show. It sent off samples to ALS Laboratories nearby – but hit upon somewhat of snag. Some of its samples were so high grade that they simply exceeded the values of zinc ALS could test the ore for. They were resubmitted, with ALS subsequently using the same method used for testing concentrate material. It turned out that eight of the samples were above 30% zinc, meaning they had to be re-tested. 15m @ 21.7% Zn, 0.05% Pb, and 7.72 g/t Ag from 36.55m. One swallow doesn’t make a summer, and these results should be read with a hint of caution. They’re still very early stage. In the middle of October, it got back the assays of the zinc samples which were initially above 30%. All of a sudden, CZL realised that it was onto something at Tres Amigos, and set to work on grabbing some drill samples from the area to firm up its hypothesis. “We are delighted with the intersection of massive sulphides where our model predicted which gives us further confidence in the planning of additional drilling,” CZL Managing Director Will Dix said at the time. Tres Amigos is closer to the surface that level 7. While level 7 may be promising, the increased economics of mining at Tres Amigos would simply be too tasty to ignore. Remember, it has limited throughput capacity at the beginning of its life, so if it can chase high-grade targets which are cheaper to extract then it’s well on its way to fulfilling phase one of the CZL plan. It’s just firmed up a $US1 million loan facility from major shareholder the Copulos Group to fund ongoing drilling at Tres Amigos to test an updip extension of the zone. Remember, the Tres Amigos zone is shallower than the Zone 7 horizon and returned ultra-high assays from three holes. Similar results from an updip extension could further validate CZL as a high-grade zinc player. As part of the funding deal, the loan can be converted to shares if CZL chooses, which means the Copulos Group has just given CZL major confidence boost. The Copulos Group has built its fortune on investing in several promising ASX-listed companies, and also just happens to be the second-largest owner of KFC franchises in Australia. It knows a tasty treat when it sees it, and has chosen to put in $1 million into CZL. Did you see our Next Small Cap article on Mozambi Resources (ASX:MOZ) $3M ASX Nano-Cap Next Door to the Biggest Graphite Resource Known to Man ? So what is CZL’s plan? The latest assays could help narrow the market’s focus on CZL as a potential high-grade zinc-lead producer into the future. However, more drilling is expected before the end of the year at both Tres Amigos and Level 7. At Tres Amigos, it is expected that it will drill about seven to eight holes while it will also drill at Level 7, but it unclear how many it will drill there. Thanks to the Copulos Group investment , investors should have plenty of drilling and even a JORC resource to have a look at as a potentially early Christmas present. At this stage, it’s possible that the drilling at Tres Amigos will form part of a JORC resource, but depending on how quickly it can get drilling at Level 7, then it’s a possibility that those holes will also be folded in. That would also start to give CZL investors a look into the longer-term game CZL is playing at Plomosas, rather than the shorter-term plan to get the ball rolling. 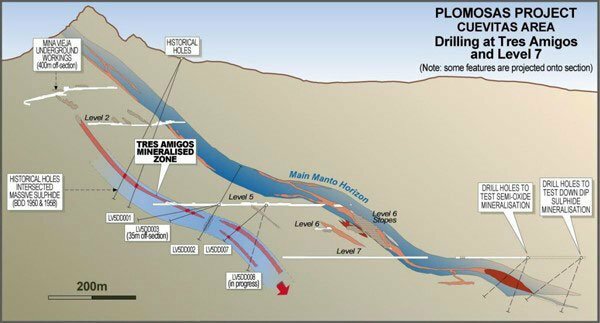 If the drilling continues to deliver results similar to what we have seen so far then early next year, CZL plans to get cracking on a Scoping Study for its phase one operations – namely the 200 tonne per day processing facility and mining operations. At the moment it’s estimating that it will cost about USD$1 million to bring the plant up to speed, but it won’t know the exact figure until the study has been completed. Longer term, it’s looking to make an Investment Decision on a larger scale project in the back half of next year, targeting an initial mine life of at least five to seven years. DJ Carmichael has estimated that a concentrator on a 250,000tpa – 300,000tpa plant would cost $21.5 million . That Final Investment Decision will become easier to make if it continues to hit high-grade intercepts, but strategically it’s playing into a couple of themes which are shaping to make CZL in the right place at the right time. Mexico has always had a strong mining culture, but not always the strongest love for foreign mining companies coming into the country. However, the times are changing in Mexico. CZL will be hoping to ride a wave of foreign investment into the country, and renewed sentiment on foreign resources companies looking to come into the country. According to Financial Times data , Mexico has become the premier destination for foreign investment in Latin America and South America. According to its data, it attracted about $33 billion from 366 greenfield projects started by foreign companies in the country in 2014. Compare this to Brazil, which had $18 billion from 322 projects in 2014. Brazil’s a BRIC nation, with a supposedly lion economy. So why are investors choosing Mexico over Brazil? It comes down to a matter of cost. According to Financial Times analysis of the data, looking at the automotive manufacturing industry, it is now cheaper for a foreign company to manufacture cars in Mexico than it is in China . It also helps that Mexico is right on the border with the US, a country with an automotive industry keen to outsource jobs south of the border. Manufacturing skills, which are often applicable to mining operations, are in increasing supply in Mexico. Wage inflation has been kept to a minimum, meaning cheaper operations. For a small company such as CZL, those points are a God send. No matter how prospective the rocks, if it can’t make the economics work then it’s not going to fly. It’s debatable whether if the same project was in Australia, whether it would possible for CZL to bring it to production so quickly. 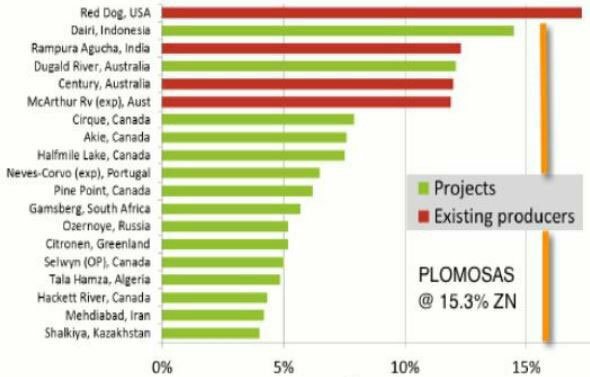 But there’s something else going on which is changing perceptions of foreign investment in resource projects. Back in 2013, when the country was about to become a net energy importer, President Enrique Pena Niento decided to open up the energy industry in the country, with foreign oil companies able to compete for new blocks for the first time since 1938. While that plan has stalled thanks to a flagging oil price, the President making the case for the need to attract foreign capital in the country has undoubtedly changed a few views in Mexico. It’s far from an oiler – but CZL has benefitted from a change in attitude in the country, meaning it is unlikely to run into some of the pitfalls other resource companies do when exploring overseas. CZL is right in the sweet spot at the moment. While it may not be producing for a year or so, it’s playing in a space which is seeing supply drop off just as demand is rising. You don’t need to be a professor of economics to figure out that it all adds up to good times for CZL. With it aiming to get some production under its belt in the near-term, it is well placed to capitalise on the trend emerging on world zinc markets. 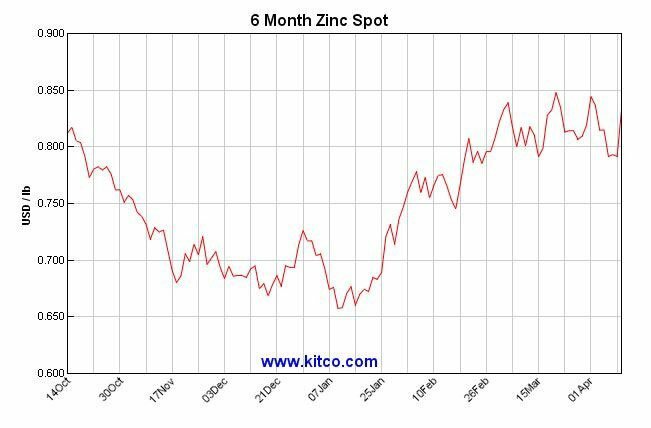 You can see from next year, the gap between the world zinc supply and world zinc demand will start to grow exponentially . We should note that this is just a forecast, so it’s not guaranteed to stay like this. The expected imbalance, however, is due to be caused by a number of zinc mines closing in a short time frame – the latest of which is the Century Mine in Queensland. It’s basically become the only main commodity in the world that isn’t experiencing a glut at the moment, as summed up in April by Bloomberg. Morgan Stanley said at the time that by 2017, more than 1.2 million tonnes of zinc will be taken out of the annual supply pool. That happens to be more than the US uses each and every year. No one player has yet been able to bridge the gap between demand and supply, so it’s more than likely up to several players such as CZL to do so. However, one of the key advantages CZL has is that it’s been able to hit a sweet spot full of high-grade stuff. CZL is not a bulk play, but a quality play. You may have seen recently that Glencore cuts its zinc production in response to a slowing zinc price – but several key analysts still feel the longer-term fundamentals are sound. And remember, CZL will not be producing into the current market but into a market which is expected to be characterised by the supply/demand gap. Also, given the price of zinc at the moment, very few companies could justify the cost of greenfield zinc development on the scale needed to address the gap. CZL, in this regard appear well-placed. It’s not trying to be the next Glencore, but instead is focusing on its on high-grade niche and keeping costs down until production can fund further exploration. With a market cap of $7.5 million, it represents a low-cost exposure to some of the higher zinc grades in the world at the moment. However, this is a small cap miner so caution is always advised before making an investment. This would means that in the future, the company simply won’t have to dilute its share base every time it wants to drill a few holes. CZL also has solid news flow coming in the next six months as it works up to a maiden JORC resource. It’s also in Mexico, a country which is opening up to foreign investment and is a low-cost environment. It’s also in the zinc market, which has fundamental strength backing it up – and some strong predictions of demand growth over the coming years.